Signs have been around for thousands of years. Dating back to the Greek and Roman empires, signs made of stone and terra cotta could be found outside of businesses like taverns and workshops and were used to identify locations. With much of the population at this time being illiterate, these signs simply featured imagery as opposed words. Signs today still serve essentially the same purpose. Of course the materials have changed, but the intent is the same, communication and identification; both of which are extremely important in an office, church or school. While the Greeks displayed terra cotta, that may do a number on your drywall, so plastic signs offer an extremely cost-effective, customizable, and simple solution. Not only does signage enhance your brand, it is also an extremely effective customer service tool. Let’s take a closer look at each benefit. 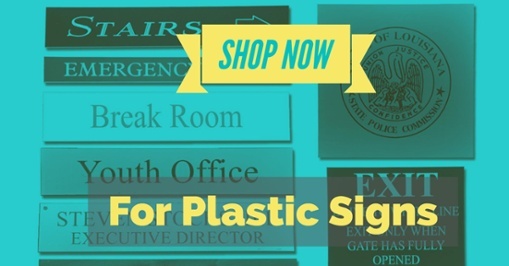 Plastic signs can be customized by color, message, and with your logo. Each sign that you hang or make visible is an opportunity to present your brand to visitors. You can even include other information to maintain engagement. Including your web address, social media channels, and other contact information provides anyone with an opportunity to stay in touch with your organization. Signage is able to communicate with visitors, guests, and employees alike. This is especially convenient when there is no one available to answer a question. It can be something as simple as business hours, or something more complex like a directory of offices, or directions to a certain location. Instead of frustrating newcomers by having them search for information, or wander aimlessly, plastic signs can answer questions before they are asked, creating a better experience for everyone. Plastic signs are very affordable, and allow for flexibility and scalability as your infrastructure changes and grows. For all of your signage needs, The Trophy House in Baton Rouge is here to help. With a variety of sizes, shapes, colors and the ability to customize and brand, these signs can and will enhance your facility.